Bahujan Samaj Party (BSP) Chief Mayawati on Monday took a jibe at Prime Minister Narendra Modi asserting that he barely managed to save himself from getting homeless in Gujarat. The former Uttar Pradesh chief minister was referring to the Bharatiya Janata Party's much-publicised 'Har har Modi, ghar ghar Modi' Gujarat elections campaign. "Har har Modi, ghar ghar Modi' wale Narendra Modi ji is baar Gujarat mein beghar hote hote bache. (Narendra Modi barely managed to save himself from getting homeless in Gujarat this time)," she said while addressing the media on the occasion of her 62nd birthday. She also attacked both Congress and BP saying that, "After independence, it was Congress and now BJP, which have troubled every section of the society. Today in every state, there is an atmosphere of communalism and casteism." Mayawati further said that BSP has tried to follow the footsteps of B.R Ambedkar, which can be seen in their policies and schemes implemented during the BSP reign. "This Ambedkar supporting party is not liked by many political parties, especially those who are elite and are spreading hate and casteism. They don't want to see this party move forward. 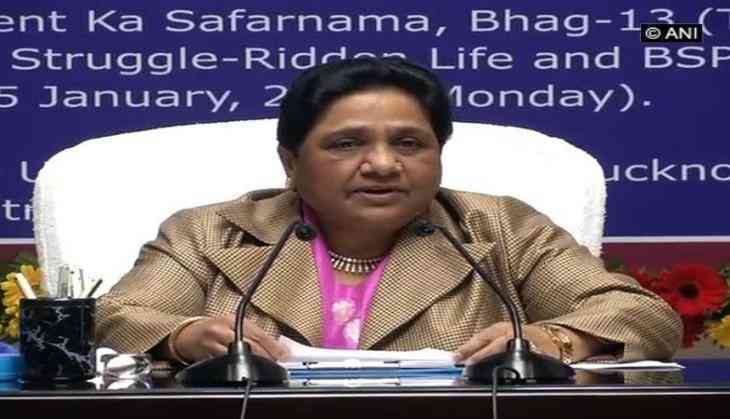 These political parties have also tried to destroy BSP, completely," she added. Mayawati also criticised the government asserting that they were being "casteists". Talking about the Bhima-Koregaon violence, Mayawati said, "Non-acceptance of holding a discussion on Bhima-Koregaon incident in the Rajya Sabha, as demanded by the BSP, shows the casteists attitude of the both the Centre and Maharashtra government."